I have to admit, I’m a bit of a brand obsessive. I don’t love a lot of brands, but when I get into something, I can be incredibly loyal, even if whatever the product is is squarely out of my price range! 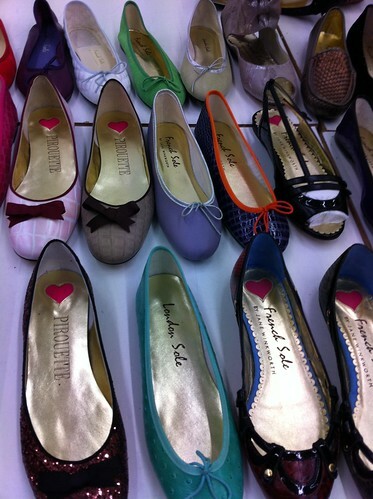 French Sole is one of those products that I fell in love with, but couldn’t really afford. I first became really aware of the brand on the lovely Duchess (aka Kate Middleton) very shortly after she got married, as she piroutted around Waitrose’s carpark wearing a pair of their pretty flats. I fell in love because I LOVE ballet flats, and this company was literally the brand to bring them to the masses – beloved of Diana in her day, too. I had a mega crush on their sparkly gold Henriettas last year, but alas, couldn’t really get a size that felt comfortable on me for the price. Then I discovered their limited edition Union Jack shoes at the end of 2011 and stalked them until they were made available in the UK. They were launched in shops only, but I hassled the poor people at the warehouse until they very kindly sent me a pair for the princely sum of £125 – more than I could really afford, but easily justifiable for the beauty of the shoes, in my opinion! (Many thanks to those long suffering warehouse staff for sending them to me before they were really available, I was so grateful I sent them a card!). Anyway, I was absolutely thrilled when I saw on Facebook that the company was holding a warehouse sale this weekend, so to treat myself after a fairly horrendous deadline, I got up at 6am, so I could get ready and drive an hour to get to the sale. I ended up getting there half an hour early, but they were already letting people in! 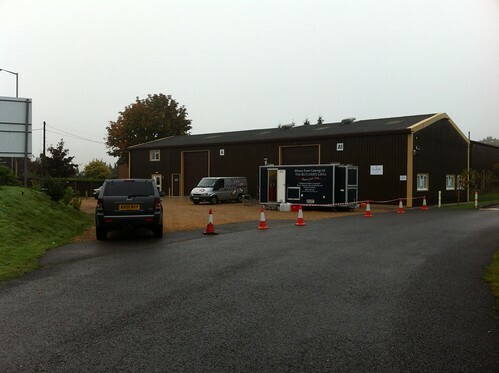 This is what the warehouse looked like on a dreary October morning – complete with a food van (that I was too excited to buy anything from!). This is the sight that greeted me inside – the sides were set up with shoes out on the table corresponding to the sizes, so I immediately ran over to the 40 section. 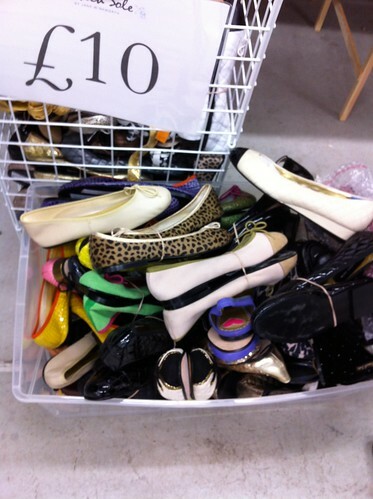 They had bargain bins with pairs for £10 each, but I couldn’t find anything in there that I liked, so I began to grab pretty shoes at random, hopping up and down and slavering at the display like some kind of uncontrolled pervert in the red light district. Honestly, though, can you blame me? These are the pairs I came away with, and I love each one. Starting from the top middle, a pair of quilted white flats with a black toe (very Chanel-esque), a pair of gorgeous brown-bronze flats (which you can’t see in the photo, but are actually lined with black fur), another pair of quilted shoes in brown with patent strips on the toes, then possibly my favourite, the brown glitter pair so similar to the ones I coveted last year (except not the same colour, but since then I’ve bought a similar pair in gold and black, so these are perfect! 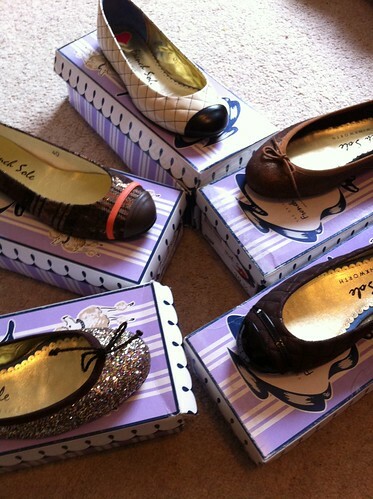 ), and finally, a cute pair of plaid flats with a bronze shimmer finish, and more patent strips on the toes. The quilted pairs were £40 each, and the others were £20, which means I got around £600 of shoes for £120. Very. Pleased. The only thing that’s not too good is that it’s been fair too cold to wear these anywhere since I bought them – roll on spring, please! Body Revolution comes to the UK! Where is it located please? 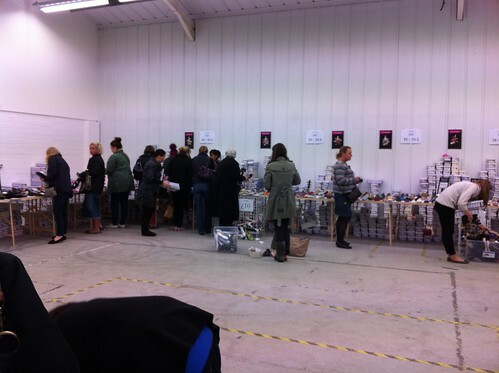 It was a one off event near the factory – they currently have permanent factory store there instead!